Until I became I mom I don't think I understood the true glory that is dry shampoo. I mean I knew it was pretty awesome, but I had no idea what days without a shower really looked like. Dry shampoo has saved me many a times, and made that top knot last just one more day. I love dry shampoo so much that I even use it on clean hair... hear me out. I put some in my hair after drying it and before curling or straightening. This adds quite a bit of texture to my hair. I love it as a styling product alternative. The thing is though all I could find was crap aerosol cans with a horrible fake perfume smell. 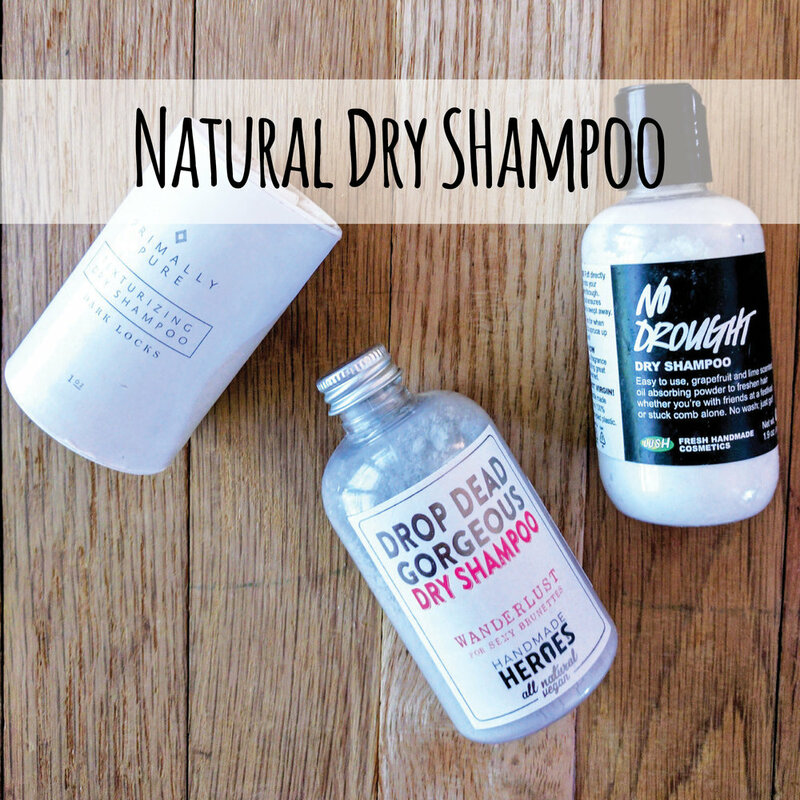 So, I went on a mission to find a natural dry shampoo with all the benefits. Honestly, when I set out on this mission, my bar was pretty low. I didn't even know if I would find a natural dry shampoo, much less one that worked. However, I did and I have to say I am impressed by all these products. These are my favorite three! The application of natural dry shampoo is slightly different. Think of it like a baby powder. The application isn't like in an aerosol can ... thanks for saving the icebergs or whatever! At first I thought it would be pretty messy, but it honestly isn't. I just shake or squeeze the powder onto my hair and then brush it through. I try to get the powder as close to my roots as possible. This way some of the oil is absorbed. The first few times you are trying this I would do it before you put your shirt on for the day. Just in case you spill some. One more tip, if you feel like you can't get it on your scalp, use an old foundation brush and just put some on there. Then you can put it on your scalp. The rating scale is on one to five. Five being the highest, and one being the lowest. The rating is based on smell, texture, application, and overall use. Smell: This is by far my favorite smelling dry shampoo. It isn't an overwhelming perfume smell, but subtle enough to cover up dirty hair smell. It smells clean and refreshing with - grapefruit, lavender, and peppermint. I mean who doesn't want to smell like that when they haven't showered? Texture: The texture this leaves in you hair is light. It doesn't make it feel all heavy and sappy (like sap from a tree, I don't know if that is a word, but it fits exactly what I am trying to say). Your fingers can still easily run through your hair after you apply. Application: The application of this is almost exactly like baby powder. It is in a little bottle with holes in the top just like baby powder. You just shake it on your head to apply. Ingredients: cocoa powder, kaolin clay, arrowroot powder, baking soda, essential oils of grapefruit, lavender and peppermint. Miscellaneous: This one comes in a light locks and a dark locks. That way the powder blends in nicely with your hair. My head itches when I don't shower.... I know I should just shower... this dry shampoo totally helped with the itching. Smell: This one smells fabulous! It does have more of a perfume smell, but man it smells good. If you like a little more smell "support" this is the one to go with. The smell is more flowery. Texture: This one is a little bit more heavy. If your hair gets super oily this one might be the one for you! It absorbs a good amount of oil and pulls it off your scalp. Application: This one is applied through one, single hole. You can get a much more targeted application, but also takes a little longer to get it all over your head. Miscellaneous: This one also comes in a light locks and a dark locks. That way the powder blends in nicely with your hair. It is also available on Amazon Prime . Smell: This one smells like lemon/lime, which I was surprised by at first. If you don't want something competing with your perfume, this is the way to go. It doesn't do as good of a job of covering up dirty hair smell, as you can imagine. Texture: This is by far the lightest feeling one in your hair. This one isn't for heavy lifting (like post workout hair), but would be great for more of a one day longer dry shampoo. It feels very light in your hair, and you can definitely still run your fingers through your hair nicely. Application: This is my least favorite application. It is just in a snap open cap. You just squeeze it out into your hand or try to get it directly on your scalp. Miscellaneous: Lush's dry shampoo wasn't exactly what I needed, because I need to do some heavy lifting on my dirty hair. It would totally work great for someone with more fine, less oily heir. Do y'all have a favorite natural dry shampoo?